Now I don't see a problem about cursing and "expressing" your opinion. This is a review, it is the final model, you have the set in your hands, you've built it and took some pictures. Feel free to drop as many f-bombs as you want. Anyway, the only relevant complaint I've seen so far is about the front of the car. It could be way better if they followed the original Cuusoo project. I see a reasonable excuse if you consider the gearbox added in the third movie. It would be harder to swap between accessories if that hood was made of a single 6x8 slope ramp, but well, I agree it's not perfect and somehow it begs for modding. I guess that fitting both minifigures inside may be possible if you bring that 1x2 cheese slope to the front, making Dr. Brown and Marty sit like Han and Chewie in set 7965. I may also be wrong, so I'll just wait for a LDD model to check that. But seriously - complaining about exposed wheels? "Easter egg" date on panel? Minor point, but its borders are the same color as the rest of it, only reflecting more light due to the shape, as far as I can see. Making it silver (not chrome, though, that would be too shiny) probably would have been a closer match, but that would cost more. I'm still getting it when it comes out on August 1st, just because I'm a big fan of the movies. The only complaint I have is that the figures are only relevant to the first movie. Hopefully if this sells well, we will get another set or two, like they did with Minecraft. Bustin' stromlings since the days of Beta. 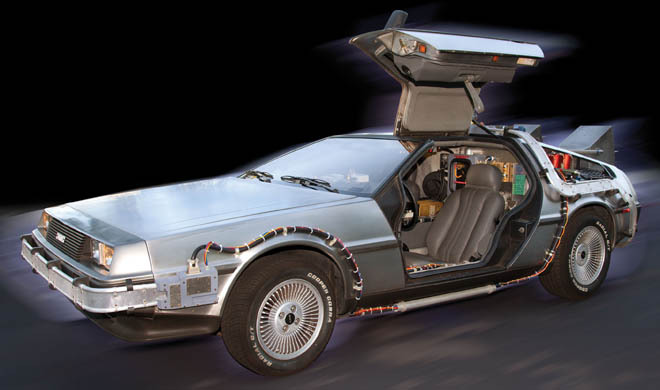 [email protected] has finally listed the BTTF DeLorean Time Machine. Aug 1 release date as onions said. I guess its the OCD in me but the pic they have posted of the California "OUTATIME" license plate irks me. The transparent red 1x 1brake lights have the LEGO stamp running vertically! At least the misspelt Flux Capacitor tile is now known to Lego Customer Services ... we'll see what they do to fix it! Ha what else could go wrong with this set ...... Recall? Nah. I do wonder what this set looks like in Bizzaro world. Bricks spelled correctly, it has wheel wells, sloped hood, dates that made sense to the film, onions loves it, minifigures both fit, it actually flys. when has the edges of something determined the overall color of what something should be? cause if that's the logic then the tyres should have been white since there are some white lettering around the edges of the original goodyears. My biggest hope for this set is that it will be wildly successful and lead to licensing of other classic properties like Ghostbusters, Tron, Beetlejuice, ET, etc. Personally I would get this set just to support that push. I couldn't agree more! Except instead of ghostbuster, Battlestar Viper or cylon Raider old style, as these sets are just itching to be made. I just could never understand why this series was never taken up. The police runner car for Blade runner. The fact that you're both naming different sets or themes and the fact that I would be interested in virtually none of them (Ghostbusters aside), rather suggests to me that all of this means what you want are rather niche and wouldn't be of interest to Lego as the margins would not be big enough. You could even argue that the BTTF theme is a bit niche. But, it IS being made, so I guess the answer is, if you want such models built, build them yourself, get them on cussoo and then hope for the best! Well, I'm not sure that any off the sets I listed would be any more or less niche than BTTF. In fact, almost everything I listed were considered blockbusters at the time, many bigger than BTTF, and now would be considered classics. Even though these properties are old, I really think the recognition of these brands by Lego's target demographic is very under estimated. Hopefully BTTF will prove that. Building them myself... well that is the whole point of Lego. Unfortunately the reality of the situation is $30 is a lot easier for me to come by than the time it would take to build these models on my own, let alone assembling the proper parts. Anyway.. my main point is that I applaud Cuusoo, and hope that everyone supports it financially as well as with votes for other classic brands. 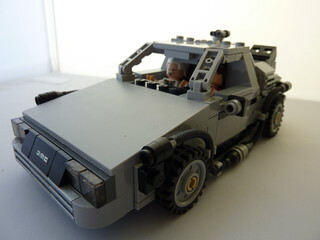 While any of those sets would certainly be interesting to see, they are all far, far more niche than Back to the Future was. It was a legitimate blockbuster that is pretty much known by everyone. LEGO could easily sell those sets to kids and adults, even if there's not a lot of push to build a line out of it. It's playing on nostalgia and a film that has aged well. The rest I wouldn't call iconic at all, except maybe the shuttle (which couldn't happen, since Star Trek rights are Kre-O). Red Dwarf was somewhat niche even in the UK, and waaaaaay niche in the US (basically just adults that watched too much PBS on Friday nights, such as myself). Blade Runner is remembered fondly now, but was a flop and most people probably remember the police cars from Fifth Element when trying to picture the Blade Runner cars (maybe that's just me). BTTF was a unique set in that it could tap a bigger demographic, and it is aimed in a lot of ways towards AFOLs but still usable by kids. Ghostbusters could certainly strike that same realm (but I find it unlikely to see it happen, since Bill Murry hates it and owns part of the rights), but you're going to run out of stuff pretty quickly that could do it. dWhisper wrote: While any of those sets would certainly be interesting to see, they are all far, far more niche than Back to the Future was. It was a legitimate blockbuster that is pretty much known by everyone. I was really talking about my list, not Marty's. On mine both Ghostbusters and ET grossed more than BTTF. Beetlejuice did less, but enjoyed some secondary popularity with an animated series for kids. Tron was surely the least popular of the four I listed but is also a Disney license, and by that virtue I figured it has a better shot than many other 80's/90's properties. We could go all day listing stuff we'd like to see. My main point was I have a feeling this set will prove that older properties can do a lot better than Lego would have thought. If this set can do much better than expected, maybe Lego decides they can produce something much less popular and still make a profit. That's an idea I'd love to put my money behind. I've finally built the set, having found some time to do it and I must say, I pretty much agree with the review. The only angle where it looks decent is from the back! bigospedros wrote: I've finally built the set, having found some time to do it and I must say, I pretty much agree with the review. The only angle where it looks decent is from the back!